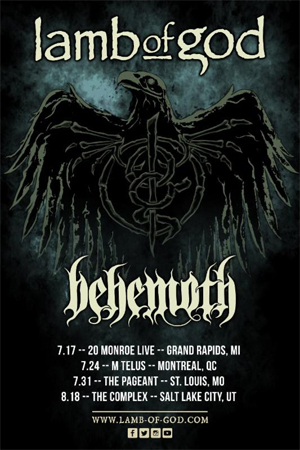 Internationally-renowned heavy rock leaders LAMB OF GOD recently announced that they will support headlining metal legends SLAYER, along with fellow supporting death metal group BEHEMOTH, on what is set to be this summer's most-anticipated heavy music tour. The six-week expedition will rage across North America beginning July 12 in Bemidji, MN, winding up in Phoenix, AZ on August 20. Tickets are on sale now via www.slayer.net/tour.